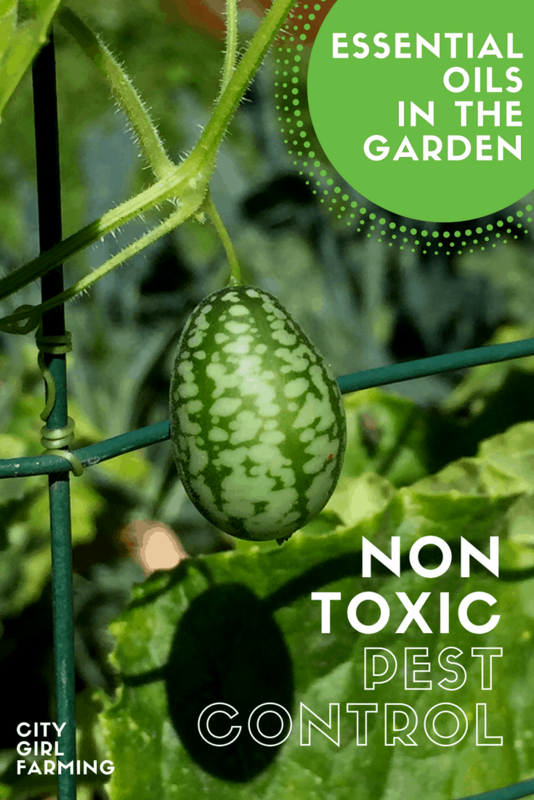 Here are some easy ways to incorporate non-toxic pest control with essential oils into your garden practices. It’s easy! And there are solutions for just about any gardening problem. Sure, everyone is talking about essential oils these days. And with good reason. They offer solutions for nearly everything. One of them is non-toxic pest control solutions for the garden. Pest control without poisoning our world is a big concern for our planet these days. And for good reason. Essential oils offer solutions that don’t contribute to the toxicity of our planet, and even more specifically, of our gardens and yards…where we and our family spend our time, and where we grow food meant to nourish and not to harm us. 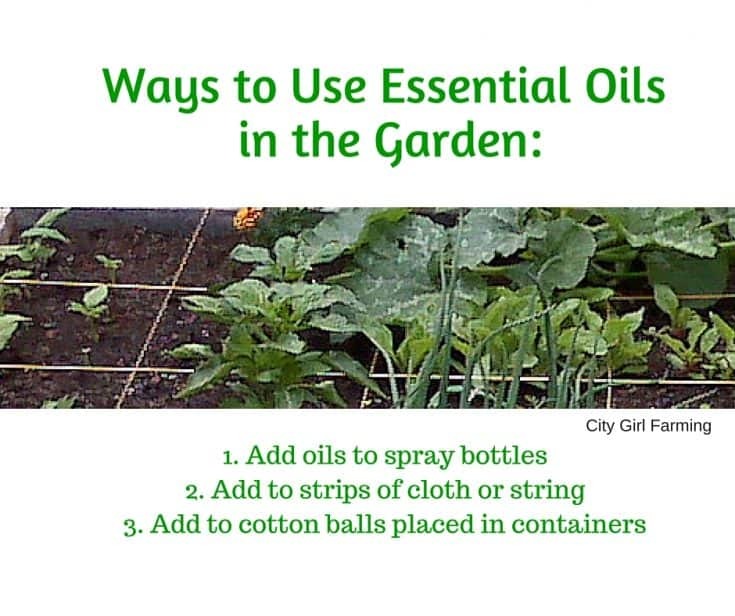 There are many essential oils that work great in the garden. 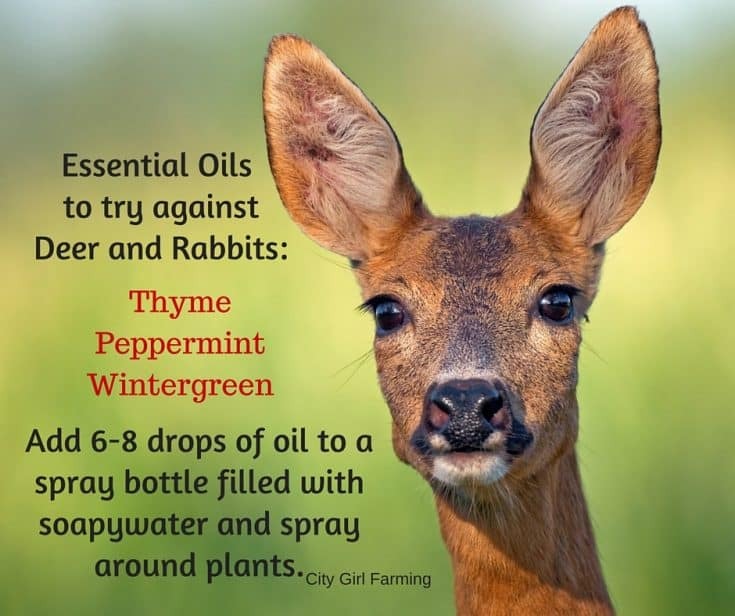 (Essential oils are present in plants to begin with, in part, to help protect the plant from disease and pests, so it makes sense that they have pest-repelling abilities.) Which oil to use, depends on what you’re trying to accomplish. 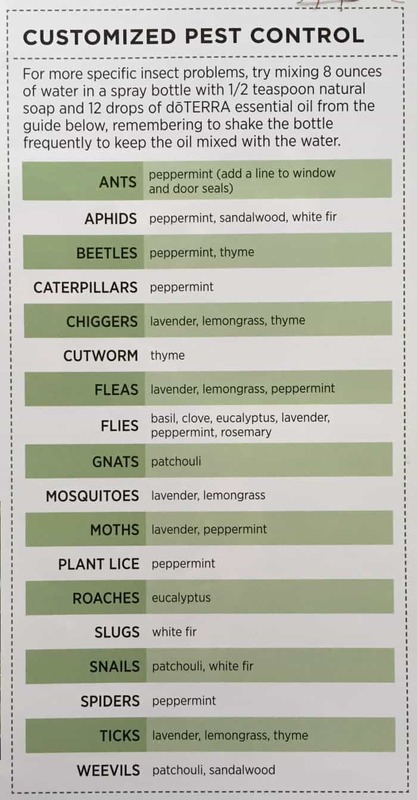 Peppermint works for many pests (ants, aphids, beetles, fleas, flies, moths, plant lice, spiders, etc) and is definitely an oil to keep in the pest control arsenal. 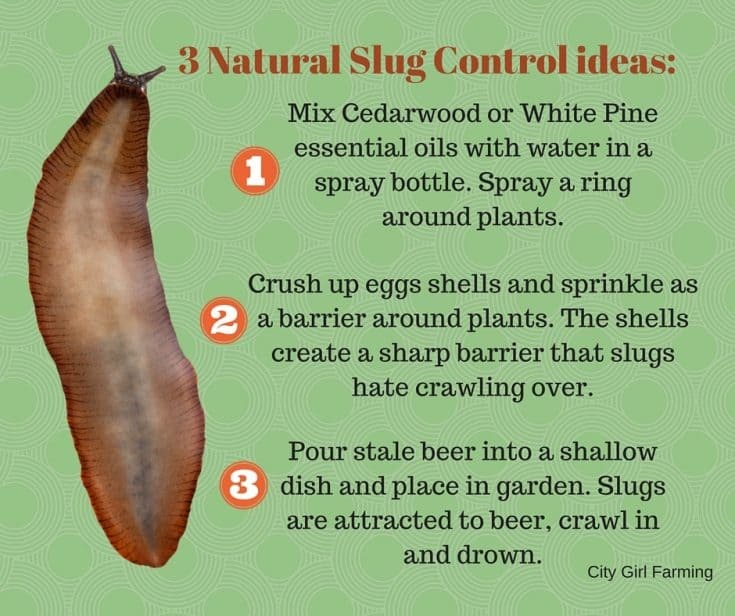 Cedarwood and white pine oils work better for slugs. 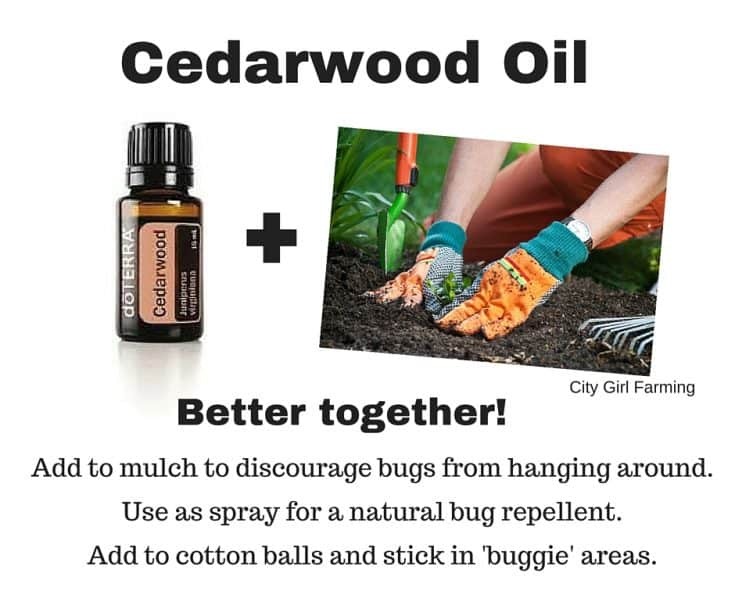 Cedarwood is also a good bug spray for people. It can also be added to mulch to help de-bug it. There are a few different ways you can incorporate non-toxic pest control with essential oils. Pick a way that works best for you. If you’d like to spray the oils onto your plants and problem areas, mix a bit of natural liquid soap, 10-20 drops of essential oil to a spray bottle and fill the bottle with water. Remember to shake often when using. You can also soak cloth or string with essential oils and hang in problem areas, or tie onto plants/plant stakes/trellises, etc. Alternatively, you can add a few drops of oil to cotton balls and place them in a small container (empty yogurt container for instance). Dig a little oil and set the container down in it, to keep it from getting knocked over. Adding oils to your watering can is also a great way to use essential oils in the garden. Simply mix a few drops of oil into your watering can and water garden or problem areas with this essential oil water. There are more than insects that are hoping for some of your garden…deer, wild rabbits and slugs are some vying for a tasty morsel. Here are a few suggestions for these kinds of pests. How bad is the pest situation you’re experiencing? The worse it is, the more often you’ll have to use essential oils until the situation is under control. You will need to re-apply after it rains or after watering (if the water goes where your essential oils are. If you are watering your garden with a watering can enhanced with essential oils, do it a couple of times per week. 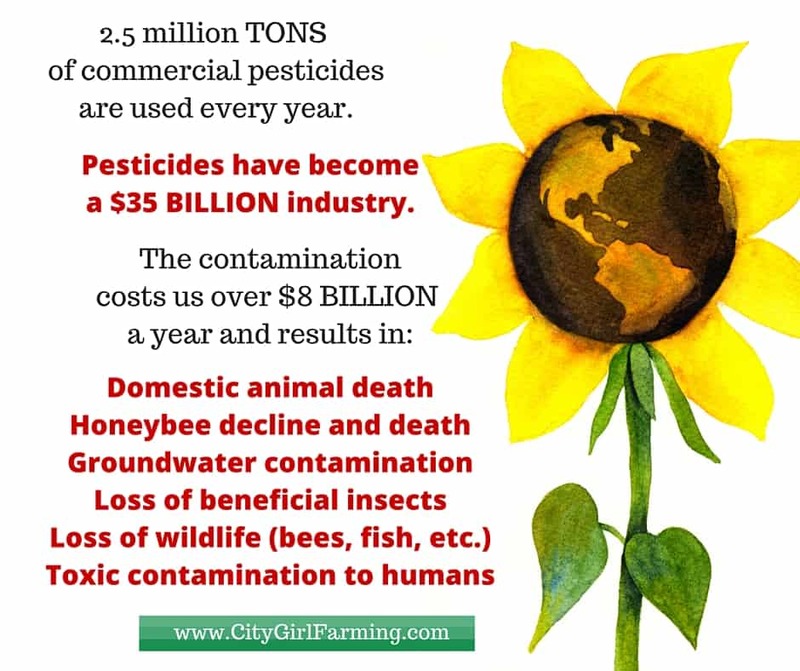 And remember, too, that non-toxic solutions don’t last as long as nasty chemicals that stay with us FOREVER. Apply essential oils more frequently, and after rain and watering. Do you want to get some of the best essential oils in the whole wide world? Here are my go-to oils. Next week I will talk to you about using essential oils similarly to how you’d do companion planting. Exciting stuff. I love that these oils are good for pretty much everything. Non-toxic, natural, simple, lovely solutions for all of life.